It’s noisy when you fly, so should we talk on the phone? Laws against talking on your phone on board commercial Us domestic aircraft are being pushed by US Congress. It seems some Congress-critters are upset at very loud and sometimes personal phone calls from people on planes sitting near them when flying back and forth to Congress. Airplanes (or aeroplanes) are very very noisy and it varies by what is going on (take off, mid flight etc. ), where you sit (front best, rear worst), type of aircraft, environmental factors such as temperature, pressure and prensece of babies in the seat behind you. The impact is a function of how loud it is and how long you are exposed. Long term hearing damage seems to start kicking in above 80-85 decibels, remembering that decibels is a log scale. 550,000 aviation workers in the UA were estimated to be ‘noise exposed’ back in 1992, which would indicate that the noise levels are pretty high, and they are – even (older) 747’s are at the 80dBA mark, and they are relatively quiet. Interestingly, I have yet to see a flight attendant wearing ear protection. Pilots – yes – but flight attendants? They must encounter a tremendous level of accumulated noise damage during their careers, especially on the smaller craft. Apparently levels lower than a Leq of 70 dB are desirable for effective speech communication, which is clearly often not the case on aircraft, hence people shouting into phones. 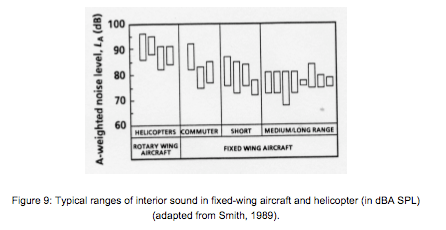 So remember that – noise levels on aircraft are actually really high. Unhealthily high. Wear ear plugs or use noise canceling headphones.. I wear ear plugs on any flight over an hour, even when I sit in the front of the plane. I use “class 4” or even “class 5” plugs, and bypass the less effective ones that you can buy in the airport or that some airlines dish out. I just bought a box, and you can get one at an industrial clothing supplier or a large hardware store. They cost about $30 to $50 for a couple of hundred pairs, and are useful not just on planes, but at concerts, in big crowds, in the garage, on the motorbike or anywhere where you need to concentrate or sleep. Back to the aircraft – we also need to take into consideration exactly what type of noise it is. Specifically this article says that we use the 300 Hz. to 7000 Hz. range to communicate, and that we use each part of that range about equally. It turns out that aircraft have a wide range of white noise across this region (as well as some subsonics which cause fatigue, maybe) and it is very difficult to hear what the person next to you, let alone what the person behind or across from you, is saying. So how do we stop people yelling into phones? The answer right there – we can actually take advantage of the white noise that airplanes make to mask the sounds of phone conversations. To do so we need to make sure that those conversations are not unnecessarily loud. When you speak on the phone with someone who is in a bar, you often find that they are shouting way too loudly for you, and it is the same on the airplane. We can solve that using technology. Microphones that filter out ambient noise and just pick up the voice, headphones that filter out ambient noise and deliver low volume but easily understandable sound. We call these devices “noise canceling or unidirectional microphones” and “noise canceling ear/headphones” or “sound isolating earphones”. Phone companies are getting pretty good at making these things, and the cheapest and easiest way to keep your voice down is to use a set of noise canceling earphones with a microphone attached. It’s also the difference between Skyping using the built in speaker and microphone and using a headset – you naturally speak a lot quieter using the headset as the sound coming in is so much clearer. So – improve the technology, and we’ll have less annoyed Congressmen and less dubious laws promulgated. The other side of this coin are the obnoxious people speaking in loud voices, seemingly oblivious to the people around them. We have been dealing with mobile phones for years, and there are increasingly established behaviors for certain activities in certain geographies. Americans on flights are rude it seems, but on trains in Europe there are cell-phone free carriages (e.g. the Heathrow Express). We also know that answering a phone in a job interview is bad, or that taking a call while dining means walking out of the vicinity of your fellow diners. Perhaps a social norm needs to be enforced on these folk – either through the power of the mob or the airline code of conduct, but certainly not through draconian laws. On the other hand the proposed law may be designed to fail, but is really about driving a change in behavior through the ensuing publicity. Internet while flying should be free, like everywhere else.